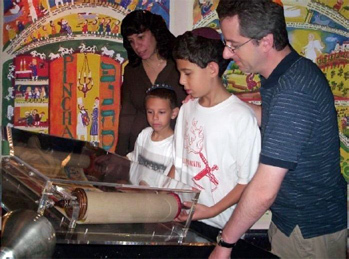 The respectfully and lovingly Illustrated Torah Scroll created by Michal Meron in a tiny, ancient walk-up in the Ghetto of Venice has found an eager audience in schools and early age schools throughout the United States. This scroll interprets the Torah with a sense of joyfulness that is exciting to children and its beauty recalls to adults some of the happiness, - reading the Torah, - once brought them. The Michal Meron Illustrated Torah Scroll is not trivialization or reductive, while accessible to children it is also valuable to people who can and love to read ‘Art’, but do not read Hebrew. For thousands of year we Jews have transmitted our beliefs and our values by honoring and studying the Torah. The study of the Torah has facilitated a high level of cognitive development among young Jewish students that has helped them in many different careers in the secular world. Because the Michal Meron Torah scroll will fascinate and involve a new generation of students and stimulate discussion it will be invaluable to a new audience. Therefore the Michal Meron scroll and her many other works based on Jewish traditions should act as a stimulus to synagogues and Jewish schools to encourage their young generations to take up the creative challenge the interpretative art scrolls pose and to try visualize scenes and important moments in Jewish History and to try to paint them. As I wrote elsewhere” Quote: "ProjectGuggenheim strives to give students the opportunity to learn about their own traditions…… and to test their own potential with new ideas, tools and techniques in spite of technical obstacles" The Michal Meron Torah scroll is a wonderful example of this principal put into reality and into action. I hope it will have the widest possible distribution and great success.